Gored Skirt. How to knit or crochet it. A gored skirt design is a good choice in many ways. It allows you to hide some lines of your body you wouldn't like to attract attention to, but at the same it has the endless possibilities for variations. Change number of gores, skirt length, width at the hem, add some additional details. It will still be that elegant silhouette, but you can make it the way you want. It has all chances to become your favorite type of skirt. There is one more advantage to it. It is pretty easy to knit or crochet and is difficult to fail if you are aware of what you are doing. Let's go step - by - step though the whole process. First thing you will need is a sketch of a gore skirt with your dimensions on it. Similar to this one on the picture. How to do a gore skirt sketch you will find at the Gore Skirt page. Now follow the steps. Step 1. Make calculations necessary to knit or crochet gored skirt. As a rule, knitting/crocheting of a skirt begins from the waist line (Line A1A3). As an example, I will use dimensions of a gore presented on a picture. The width of a gore is 18 cm at the top. Its length is 64.5 cm. To calculate 1/2 of the width (line K4K5) of a gore at the hem line, we will need to compare two similar triangles: A3H3H2 and H2K2K5. K2K5 = (H3H2) x (H2K2) / A3H3 = (3.75cm) x (47.5cm) / 17cm = 10.5cm. 18cm - width at the top, 46.5cm - width at the bottom, 64.5cm is its length. 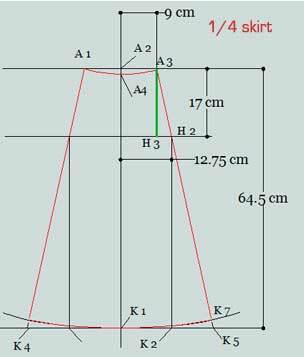 Note: At the hem line a gore shape follows a curve, while we calculated length of the straight line K1K5 considering it as a hem line. Don't be confused. For our purpose it will work for any width of a gore at the hem line. You will need to make a gauge swatch. Information about making and calculating it can be found at Beginner Crochet page. For our example I will use a gauge: 22sts = 10cm, 13 rows = 10cm. Step 3. Calculate increases to shape a gore. 18cm x 2.2sts/cm = 40sts (rounded). 46.5cm x 2.2sts/cm = 102sts (rounded). 102sts - 40 sts = 62 sts. 31 sts from both sides of a gore have to be added. 64.5cm x 1.3 rows/cm = 84 rows (rounded). There are a few ways to increase number of stitches from the waist to the hem line. If you are planning to make a skirt of the separate gores and after that to sew them together, make increases evenly along the side seams. In our example to add 62 sts through 84 rows, you will need to add 1 stitch at the beginning and at the end of each 3rd row. This way the number of stitches added is: (84 rows / 3 ) x 2 sts = 56 sts. Difference 62sts - 56sts = 6sts has to be distributed evenly through 84 rows. For example, they can be added in each 7, 14, and 21 row where increases are planed to be made. In case a gore has a well-noticeable stitch pattern, it is better to make increases inside a gore following the stitch pattern. Distribution of increases through the length of a gore not necessary has to be even for this case. But all calculations for the number of increases presented above will still be the same. The cleanest and the neatest look your gored skirt will have if it is knitted or crocheted without any side seams. Once again, all calculations for increases are valid for seamless variant of a gored skirt also.